An iconic pohutukawa hanging over Karekare Road is being investigated by Auckland Transport for removal. The Waitakere Ranges Local Board last night (13 August) passed resolutions opposing any action on the tree and have written to the AT Board chair Lester Levy asking him to intervene to save the tree. The tree is at risk because it is within the 4.25 metre road corridor envelope. There are signs at both end of Karekare Road warning motorists of this and taller vehicles can use Lone Kauri Road. 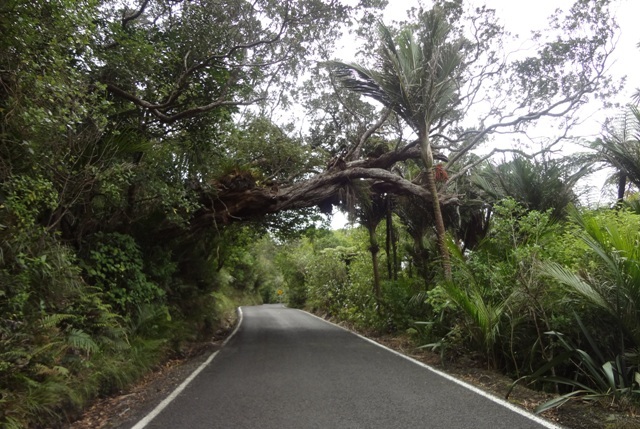 Auckland Council and Auckland Transport are currently investigating the safety of the pohutukawa tree that crosses Karekare Road. While the tree has been there for some time it appears to have dropped marginally over the last few years, further restricting the clearance for vehicles. We are currently getting more information about the treeâ€™s stability and seeking advice about the road clearance height, as legislation requires that vehicles have a 4.5m clearance. No decision has been made about the future of the tree, which is very special to the local community and no decisions will be made until we have all the information about the treeâ€™s safety and road clearance. Auckland Transportâ€™s Local Board Engagement Plan has specific rules around â€œsignificantâ€ vegetation removal requiring community and Local Board consultation. Auckland Transport will be honouring that agreed process and will do nothing substantive until that is complete. So while this gives the tree a reprieve it is clear that local residents will need to be vigilant to protect this tree and others that are under threat from AT. The issues surrounding the tree are the same as similar cases in Piha, including Piha pohutukawa in Beach Valley Road. The same argument was run, that trees within the road corridor envelope can be pretty well removed by AT at will.